Sepia officinalis is one of the most easily cul-tured cephalopods (Richard 1971; Pascual 1978; Boletzky and Hanlon 1983; Forsythe et al. 1994; Lee et al. 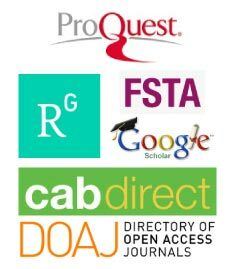 1998; Domingues et al. 2001a,b, 2002, 2003a), and is a commercially important species throughout the world (Roper et al. 1984). It is highly adaptable to life in captive conditions (Forsythe et al. 1994; Domingues et al. 2001a,b, 2002, 2003a,b, 2005, 2006; Skyes et al. 2006; Şen 2009). Its life cycle in the laboratory varies from less than 6 months to 17 months with tem-perature, feeding regime and culture density (Richard 1971; Forsythe et al. 1994; Domingues et al. 2006). In the wild, cuttlefish live for 2 years on average, and the spawning period varies con-siderably with temperature (Guerra 2006), with females usually being much larger and older when they start spawning compared to laborato-ry-cultured cuttlefish. Moreover, it’s known that cuttlefish lay their eggs on various things especially floating things such as wood or branches of some macroalga and corals, fish net and/or other manmade objects (Choue, 1966; ; Arnold et al., 1972; Okutani, 1978; Boletzky and Boletzky, 1973; Şen, 2009). Nevertheless, there is only one information can be found from the Boletzky’s (1983) study in the literature. So far, the data related to appropriate diameter of strings or other materials for laying eggs of S. officinalis hasn’t been indicated in terms of rearing or culture studies. Therefore, preference to string diameter may be important while spawning of the cuttlefish in captivity. The aim of this study was to determine the im-portance of string diameter preference on spawn-ing performance of S. officinalis. The experimental animals were captured off the Izmir Bay by trammel nets on April 3, 2012. Totally 22 S. officinalis (11 males and 11 fe-males) were selected and placed in an open flow-through filtered sea water system with two cylin-drical polyester tanks (450 L volume) in indoor facilities of the Fisheries Faculty of Ege Univer-sity (Urla, Izmir, TURKEY) at the end of the spawning (April 3-17, 2012). Avoiding conges-tion the cuttlefish were divided in two groups (5 males and 5 females, and 6 males and 6 females). Natural photoperiodicity was adjusted. The oxy-gen and pH meter YSI 5750 and salinity hand re-fractometer 508-IIW were used for measure-ments. The specimens were fed ad-libitium with low market price fish species (i.e. Sardine pil-chardus, Engrualis encrasicolus) by hand. The following day, uneaten part or remains were re-moved by siphoning. The mean mantle length and body weight of the individuals using the ex-periment were 12.97±1.46 cm and 231.5±48.9 g (n= 22), respectively. The seven strings, 3.0, 4.0, 6.0, 8.0, 10.0, 12.0, and 14.0 mm in diameter were chosen in one meter length. 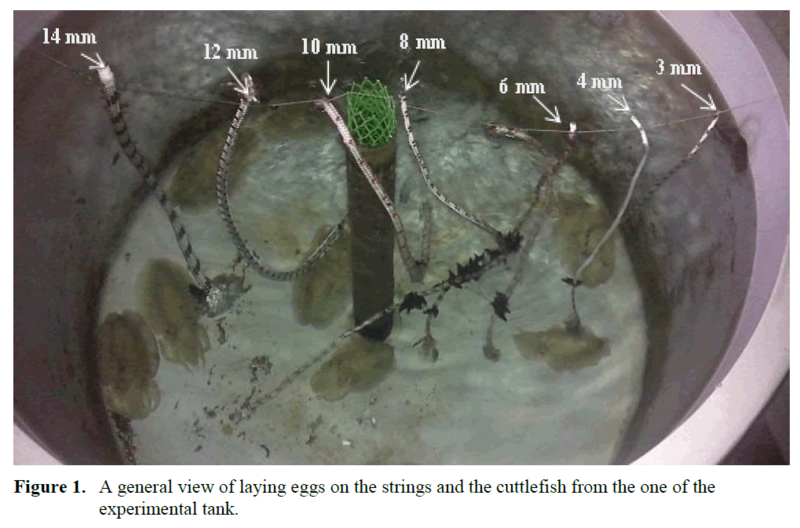 After that two batches of strings for spawning of the cuttlefish were hanged on the experimental tanks (Figure 1.). Daily control was carried out for how many eggs were laid on the strings and which string diame-ter or diameters were preferred for spawning by the cuttlefish. Figure 1. A general view of laying eggs on the strings and the cuttlefish from the one of the experimental tank. The obtaining data were given as mean ± SD values in the text. The differences among means of the spawned egg numbers and the spawning numbers on chose string diameters were tested using chi-square test to determine any signifi-cance (P<0.01). The salinity, pH, O2 saturation and temperature in tanks were measured as 37±0.2‰, 8.1±0.1, 65±5%, and 16.5±1°C, respectively. The experi-ment lasted 14 days. During this period the cut-tlefish mated multiple times in the tanks. Addi-tionally, it’s observed that after each mating the males generally allowed females to feed first. Al-so, agonistic behaviour occurred frequently in the tanks. Furthermore, total 53 spawning occurred and total 1519 eggs were laid on the strings. There were significant differences among string diameters (P<0.01) based on the egg numbers. On the other hand, there wasn’t any significance between string diameters according to the spawn-ing numbers (P>0.01). The string diameter pref-erence in the cuttlefish were 6-8>10-12>3-4 mm in diameters with regards to egg numbers (P<0.01) (Table 1.). However, the 14 mm in string diameter was excluded from the statistical analysis because it was hardly chosen. Table 1. The total numbers of chosen string diameters and eggs. Present findings related to mating behaviour in the cuttlefish is parallel to that of Hanlon and Messenger (1996). Furthermore, the males al-lowed to first food intake of the mated females after mating which is observed firstly in the cur-rent research. Also, the agonistic behaviour is a known phenomenon in the cuttlefish (Hanlon and Messenger, 1996). In conclusion, the current results indicated that the cuttlefish prominently pre-ferred the 6 and 8 mm in string diameters (P<0.01). The 14 mm in string diameter was cho-sen hardly ever. Therefore using this diameter is inadvisable according to the present study. Also, Boletzky (1983) said that S. officinalis lays its eggs on the oblong object, not more than 1 cm in diameter. The current results generally in agree-ment with that of the Boletzky (1983)’s findings. Finally, the present results showed that the 6 and/or 8 mm in diameter of strings can be select-ed for spawning of cuttlefish in terms of aquacul-ture or biological studies. Unfortunately, the ac-tual evidences couldn’t be compared with any studies related to this subject. However, more de-tailed behavioural and/or physiological studies on why cuttlefish prefer the definite diameter for spawning is needed. Arnold, J.M., Singley, C.T., Williams-Arnold, L.D., (1972). Embriyonic development and post hatchling survival of the Sepiolid squid Euprymna scolopes under laboratory condi-tions, The Veliger, 14: 361-364. Boletzky, S.V., (1983). Sepia officinalis. Boyle P.R. (ed) Cephalopod life cycles. Vol.1. Ac-ademic Press, London, pp.31-51. Boletzky, S.V., Boletzky, M.V., (1973). Observa-tion embriyonic and early postembryonic development of Rossia macrosoma (Mollus-ca: Cephalopoda), Helgolender wiss Meer-esunters, 25: 135-161. Boletzky S.v., Hanlon R.T. (1983) A Review of the Laboratory Maintenance, Rearing and Culture of Cephalopod Molluscs, Memoirs of the National Museum Victoria, 44: 147–187. Choe, S., (1966). On the eggs, rearing, habits of the fry and growth of some Cephalopoda, Bulletin of Marine Science, 16: 330-348. Domingues P.M., Bettencourt V., Guerra A. (2006) Growth of Sepia officinalis in captiv-ity and in nature, Vie et Milieu, 56: 109–120. Guerra A., (2006). Ecology of Sepia officinalis, Vie et Milieu, 56: 97-107. Hanlon, R.T., Messenger, J.B., (1996). Cephalo-pod behaviour. Cambridge University Press; 230 pp. Lee P., Turk P., Forsythe J., DiMarco F., (1998). Cephalopod culture: physiological, behav-ioural and environmental requirements. Suisanzoshoku, 46(3): 417-422. Okutani, T., (1978). Studies on early life history of decaodan Mollusca. VII Eggs and newly hatched larvae of Sepia latimanus Quoi ans Gaimard, Venus (Japanese Journal of Malacalogy), 37: 245-248. Richard A. (1971) Contribution a` l’e´tude ex-pe´rimentale de la croissance et de la matu-ration sexuelle de Sepia officinalis L. (Mol-lusque, Ce´phalopode). The`se 248, Univ. Lille, France. Roper C.F.E., Sweeney M.J., Nauen C.E., (1984) F.A.O. Species Catalogue, Cephalopods on the World. 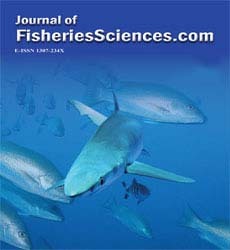 An Annotated and Illustrated Catalogue of Species of Interest to Fisheries, in F.A.O. Fisheries Synopsis, 1-277. Sykes A., Domingues P.M., Correia M., Andrade J.P., (2006). Cuttlefish culture – State of the art and future trends, Vie et Milieu, 56: 129-137.